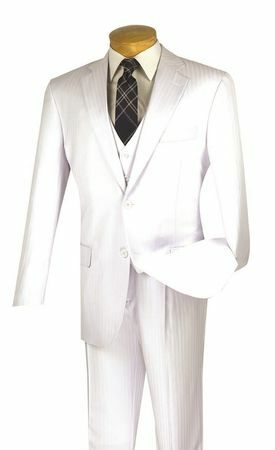 If you like wearing a white suit with stripes when it's in the Summer months or need a white suit with stripes for a wedding, take a look at this 3 piece model from Vinci suits. There is something about wearing a white suit with stripes that gives the man a stunning look and this suit has it in spades. Featuring a regular fit jacket with notch style lapels and double side vents, this white suit simply makes you look great. The pants are pleated and and made of a tonal white stripe fabric that is super 150s poly/rayon. You'll love the way you look in this stunning white suit with stripes from Contempo.